Forklifts are used in many different kinds of settings and industries. They have made many types of work processes realities, but not all forklifts are made the same. Counterbalance forklifts are just one of many types, and are designed for a specific set of tasks that can only be used efficiently and safely with counterbalance forklift training. ForkliftCertification.com is the premier training source for OSHA compliant forklift courses. Our counterbalance forklift training is ideal for any employer with gaps in their forklift training matrix. With a great selection of counterbalance forklift classes, we’ll get your entire forklift fleet up to speed in no time! The costs of non-compliance are too expensive – in many cases, OSHA violations can cost over $10,000! That’s just one reason why getting your employees’ counterbalance forklift certificates is important. Plus, your workers will thrive in a safe, productive working environment. OSHA compliant training from ForkliftCertification.com is a win-win situation for everyone. Sign up today and get the counterbalance forklift training you need! Counterbalance forklifts are what you most likely image when you picture forklifts. They have two forks sticking out in the front without protruding arms or legs on the sides. The streamlined design allows them to drive right up to warehouse shelves and racks, and loads. They can be used in narrow aisles because of their space-saving design. They can be gas, diesel, or electrically powered. Counterbalance forklifts are one of the most common types of lifts used. Since they’re so versatile, companies all over the United States rely on counterbalance forklifts to manage, store, and transport cargo. With a relatively simple design and reliable performance, counterbalance forklifts are made by a wide range of manufacturers. However, once you learn how to operate a counterbalance forklift from one manufacturer, you can apply those same skills to others. Our three different counterbalance forklift training courses show you everything your employees need to become OSHA compliant. What Are Counterbalance Forklifts Used for? Counterbalance forklifts are most commonly used indoors, inside warehouses and retail spaces. They are sometimes used outdoors on even, stable surfaces. Counterbalance forklifts are ideal for nearly all kinds of work in warehouses and distribution centers. They can maneuver within tight spaces and work very efficiently alongside shelves of inventory, and they are great tools for use in settings where space is limited because they can turn and change directions very tightly. Efficient for both indoor and outdoor work, and racking loading, counterbalance forklifts are trusted tools in most warehouses and retail centers. If your company uses counterbalance forklifts, sign up with ForkliftCertification.com today. We’ll show your entire workplace the proper, safe, OSHA-approved way to operate every powered industrial truck. Do My Employees Need a Counterbalance Forklift Certificate? The precision of the counterbalance forklift is what makes it so efficient and productive, but it’s also what makes specialized training for operators so important. Working right alongside warehouse shelves and racks of products, as well as navigating narrow aisles, can present many hazards for operators and bring forth different dangers. It is very important for operators to complete counterbalance forklift training and receive their counterbalance forklift certificate to learn how to properly drive both regular and three-wheel counterbalance lifts, maneuver tight spaces, properly handle and travel with loads, and avoid accidents involving collisions and falling objects. Employers are subject to expensive OSHA fines if their workers don’t have their forklift counterbalance license. It’s against the law to have anyone operate a counterbalance forklift (or any powered industrial truck) without a counterbalance forklift certificate. With OSHA training from FLC, your employees are qualified for all kids of counterbalance forklift driver jobs. Since these types of forklifts are used throughout the country, consider their OSHA counterbalance forklift certification a ticket to greater job versatility, along with a safer workplace. What types of job environments use counterbalance forklifts? Counterbalance forklift jobs are easier to fill if you offer the right training – and ForkliftCertification.com will help you along the way! WHERE CAN I GET COUNTERBALANCE FORKLIFT TRAINING OR A COUNTERBALANCE FORKLIFT CERTIFICATE? ForkliftCertification.com offers an online counterbalance forklift training program that teaches workers everything they need to work with counterbalance forklifts safely and successfully both indoors and outdoors. It covers accident prevention, operational instructions, and all important regulations. It’s completely OSHA-compliant and only takes about one hour to complete, all from a smartphone, laptop, tablet, or desktop. Save money by not traveling to an expensive off-site facility for training. You can get everything you need from a device at home, at your own pace. The counterbalance forklift training cost is only $299, which includes free three-year renewals! Our counterbalance forklift classes are ideal for employers with training needs. Save money and save time with ForkliftCertification.com – we’ll get your safety program up and running today! ✓ Train a Trainer – this course will help all your employees become well-versed on OSHA safety practices. If you’re looking to become your company’s main OSHA training resource, this is the course you need! ✓ Bundle Package – can’t decide between the two? Get both for exceptional value! The Bundle Package includes all counterbalance forklift training content contained in the Train a Trainer and Training Kit. 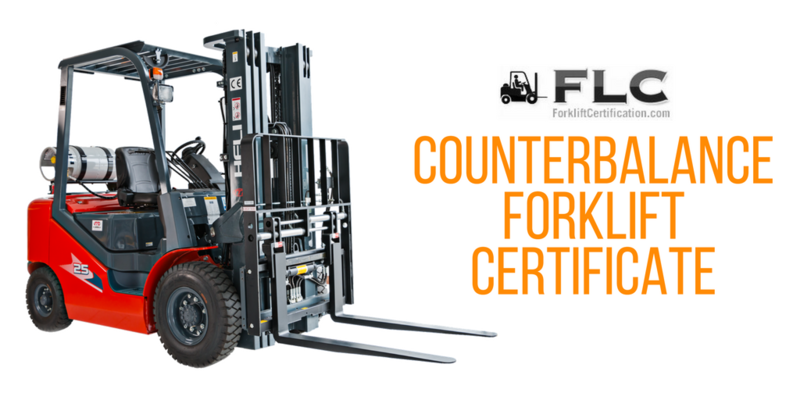 Learn more about counterbalance forklift training and receive your counterbalance forklift certificate from ForkliftCertification.com! We’re ready to help today with your counterbalance forklift training program. Both employers and employees alike will benefit from our OSHA certification. If you have any questions about our counterbalance forklift training courses, give ForkliftCertification.com a call today at (888) 278-8896.